The Turkish Vankedisi is basically an all-white Turkish Van, with distinctive markings on the head and tail. 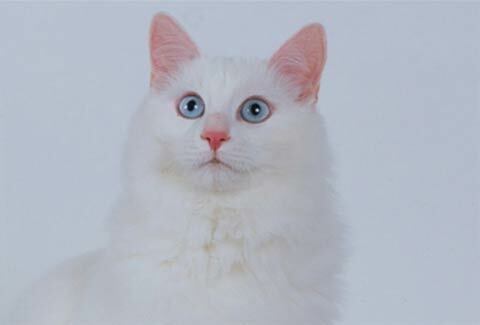 Turkish Vankedisi have similar characteristics to the Turkish Van cat breed. The coat is soft and silky (with no undercoat) and eyes may be blue or amber (or one of each). The Turkish Vankedisi's bone structure is broad, muscular and deep-chested. The mountainous region of their origin in Turkey endures extreme temperatures, and these cats shed their long hair for a shorter coat in the summer. Tufts of fur between protect their paws from both icy chills and burning heat. Turkish Vankedisi also share the Turkish Van's reputation for loving water, so expectant owners should be willing to share their shower!